The Tanoshiboy Chronicles: Design & Illustration Blog: Who dares attack the son of Zeus? Who dares attack the son of Zeus? Isn't Greek mythology awesome? I've always loved it. Seeing as it's my birthday I thought I'd tell the story of Heracles, better known as Hercules. Hercules was the son of Zeus but was born from his human mother Alcmene. Zeus, ever the lustful King of the gods, loved to visit human women and have affairs. He would sexually arouse them by taking different forms. Once he changed into a swan and got his groove on, which says some weird stuff about the girl. He fathered many children to the "delight" of his wife Hera. Hera, feeling slighted by all the illegitimate offspring, focused all her hatred on Hercules -- even before he was born. 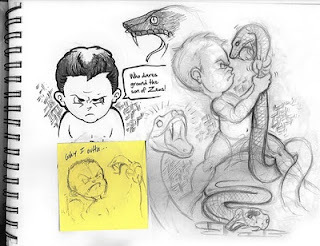 On one occasion she sent snakes into his crib to attack the baby Hercules. Fortunately, when his Mother came to check in on him he was found cooing and playing with the bodies of his strangled, would-be attackers. It wasn't the last time Hera would strike at Hercules. She did quite a few things to torture him. It wasn't all singing and good times like Disney would depict. So read up on this hero and enjoy the sketch. thanks for the visit, love the monster design down below. Awesome stuff! Herc has never been so adorable. that guys is totally awesome. happpy birthday!! I seriously love this lil angry guy!!!! Ya he's starting to grow on me. I love your artistic style. These are some great pieces. I once could draw but then I put that aside to learn web design. @Tigga76 - Thank you. I would love to see your web design work. Email me.